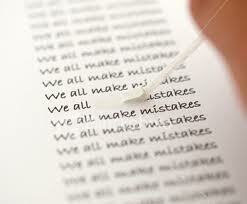 Mistakes are, after all, unavoidable. We have only three options for dealing with them. First, we can work hard to prevent as many as possible. Getting solid training, as we are doing, is a good step. Referring back to our texts from time to time would help too. I find I frequently see things that I missed when I go back to old sources. As we grow and gain experience, we have more context for the lessons we have been taught and those lessons reveal more meaning. We can also continue with our professional development and continuing education to increase skills. With all this training, we simply need to add careful, thoughtful planning and constant self-scrutiny. By doing all these things, we will reduce our incidence of mistakes. Second, we can be aware of mistakes when they occur to minimize their damage. Sometimes this is as simple as correcting a misstatement. Other times, it actually involves some clean up, perhaps an apology. Yet, in my experience, the density of mistakes in the world is so high that circling back to ameliorate a mistake frequently causes more problems than it solves. The best way to make up for a mistake is often to keep moving forward, committing do better in the future. Third, we can identify and analyze mistakes after they have occurred in order to adjust our behavior and reduce their likelihood in the future. This is not hard but it does require discipline and the willingness to constantly be reminded of our human fallibility. The good news is that constantly learning from mistakes is the best way to constantly increase professional competence and outcomes. By committing to learn from our mistakes, we commit to striving for the very highest levels of achievement for our students. That is more than worth the effort.